Despite the negative announcements from central government PGC along with other companies in the wind industry are determined to grow the sector from their basis here in Northern Ireland. Precision Gear Company based in Toomebridge has a long heritage in the wind industry and has grown with the wind industry over the past years learning how to adapt to the ever moving requirements of this young and challenging industry. When Precision Gear Company entered the market 500kW turbines were regarded as being very large, that was then now the norm is 1.5MW to 3MW for on shore and up to 6MW off shore. These are large pieces of equipment that are manufactured for the most part in northern Europe and the US. Precision Gear Company specializes in the repair and inspection of the gearboxes fitted to wind turbines of all sizes. To date these units when in need of service have been lowered to the ground and brought to our workshops in Toomebridge, this is a particularly costly exercise that requires cranes, labor and trucks. Depending on the condition of the gearbox this may be the only option but we have been seeing more cases where the unit can be repaired in the turbine. To this end PGC have introduced its “UP TOWER SERVICE” this provides the customer with a cost effective solution for gearbox repair and is particularly effective in the larger range of turbines of 1.5MW and up. Our trained technicians have all of the certification and training required to carry out this work in a cost effective, safe and timely manner. PGC engineers have many years experience in a workshop environment that has now lead onto the introduction of the up tower service. 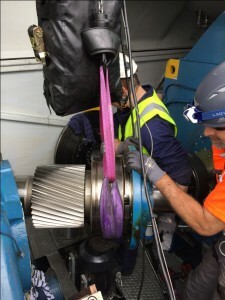 The service is carried out in the following manner; firstly a technician will visit the turbine with an endoscope to carry out a detailed visual inspection this will pinpoint the area in the gearbox that needs attention. An assessment will then be made which will look at the two options 1/ can the unit be repaired up tower or 2/ does the unit need to be removed and repaired in the workshop. If the unit can be repaired in the turbine all paper work is put in place and the technicians are sent to site this normally takes two days or if we are pre registered with a company the work can be carried out immediately. PGC pride our selves in getting the asset back up and running as soon as possible and to do this we have had to be adaptable in our approach to maintenance, this in turn will help the customer’s profitability and we have found that a profitable customer is a happy customer.